A Broadway in GTA San Andreas. The Broadway is a lowrider featured in Grand Theft Auto: San Andreas. The Broadway is styled to bear resemblance to an open top car from the late 1940s, specifically a 1947 Cadillac Series 62, but is only available in convertible form. Broadways are also the only vehicles in the game that allows the player to do Pimping missions. 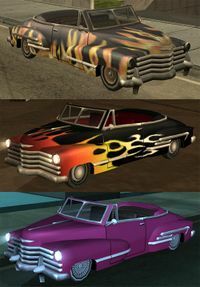 In addition, being a lowrider that supports hydraulics from Loco Low Co., a Broadway can be used to participate in the Lowrider Challenge in Unity Station, Los Santos. If it has hydraulics, the lowrider control for hopping interferes with starting a pimping mission and vice versa, making it unfavorable for doing stunts and tricks. The Broadway's road-going credentials are good, possessing a good top speed and responsive cornering and braking. However, the Broadway's speed is hampered by slightly delayed acceleration, and can easily flip over if the hydraulics are jacked up. Although it doesn't appear to have a visible fuel cap, it will explode if the back license plate gets shot. Jizzy's Broadway has purple seats with a beech-color paintjob and bears a license plate which reads HO 2 HO. The default radio station in the Broadway is Master Sounds 98.3. The Broadway is the 2nd lowest vehicle in the game. Although it won't produce a continuous stream of sparks like the Tornado, It sporadically clips the ground while driving straight with the nose up. Drags more while turning, uneven road surfaces, or curbs, but never really showers the pavement in sparks. Next to a gas station in Idlewood with a unique white paint job, occasionally equipped with hydraulics. In the underground Rodeo hotel parking lot, occasionally equipped with hydraulics. This page was last modified on 14 September 2013, at 03:30.